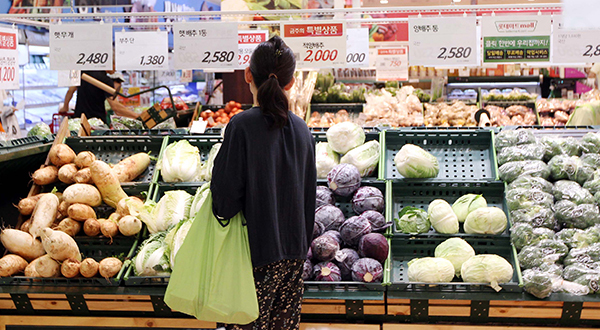 South Korea’s headline inflation in February was at its weakest since August 2016, slipping further back in the zero territory as volatile oil and fresh food prices turned lower on top of lackluster consumer demand. 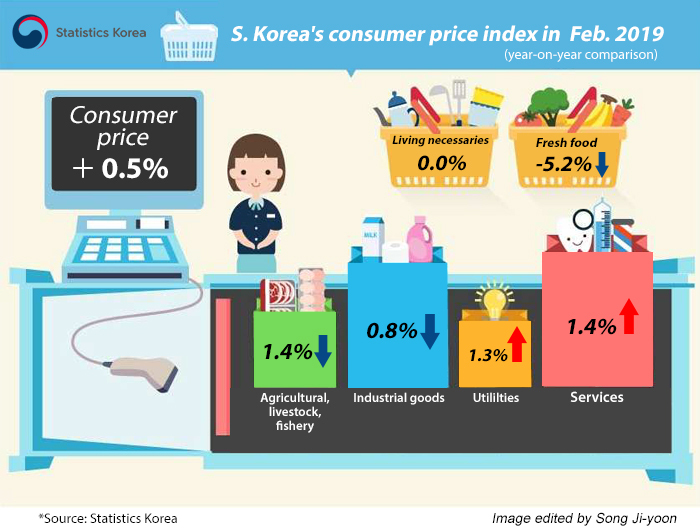 According to Statistics Korea on Tuesday, the country’s consumer price index (CPI) added 0.5 percent in February from a year earlier, retreating further from the previous month’s 0.8 percent. The Bank of Korea in last week’s monetary policy meeting cited zero inflation as a factor to stay pat on rates. Core inflation, which excludes volatile oil and agricultural goods, gained 1.3 percent from a year earlier, sustaining the level of previous months. The CPI that strips out food and energy categories, the standard of the Organization for Economic Cooperation and Development (OECD), edged up 1.1 percent. Prices of petroleum products plunged 11.3 percent on year, dragging down the headline inflation by 0.51 percentage point. Gasoline prices plummeted 14.2 percent, diesel 8.9 percent and auto LPG 9.9 percent. The sharp decline began in December following the November tax cut in domestic fuel taxes and the fall in global crude prices. Prices of agricultural, livestock and fishery products also fell 1.4 percent, pushing down the headline CPI by 0.11 percentage point. Vegetables saw the largest drop, tumbling 15.1 percent to knock off 0.27 percentage point from the headline inflation. The decline was particularly marked this year as prices were compared against last year when fresh food prices spiked due to the unusually cold winter. Service charges including rent were up 1.4 percent to lift the headline inflation by 0.78 percentage point. Public service charges fell 0.3 percent while personal service charges jumped 2.5 percent, with out-of-home dining services up 2.9 percent. Taxi fees also climbed 6.9 percent, the highest in more than four years. Utilities fees rose 1.3 percent, on par with previous months. The index for everyday expenses reflecting spending for stable food and utility fees was flat against a year earlier. The fresh food index including vegetable, fruits and fish slumped 5.2 percent, decelerating sharply from the 1.2 percent rise in December.